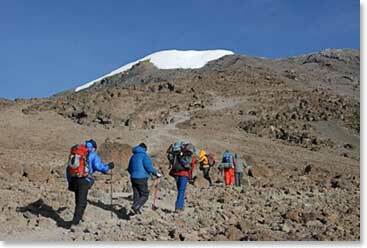 This climb on Africa’s greatest mountain, Kilimanjaro, remains a favourite for many. The Lemosho route begins at the rarely visited western edge of Kilimanjaro, bypassing the overcrowded alternate routes. The team will traverse the wild and unspoiled Shira Plateau and reach the crater rim. After reaching the crater rim, they will go for the summit or take advantage of a night's rest in the crater before waking in the early morning to ascend to the top of Africa. With the ultimate experience of sleeping in the Crater Camp, they will get the opportunity to have a closer look at the marvels of Kilimanjaro’s towering glacial wall of ice. With daily dispatches they will keep you informed of their progress and experiences. Stay tuned! August 10, 2009 – Team Summit Success!